Install the unmanaged package to implement Volunteer Tracker assets for all users. If you have trouble installing a managed or unmanaged package or app from AppExchange, follow the steps in this article. Some of the terminology used in this superbadge is descriptive and may not match the name as it appears in the UI. This is to test your knowledge of Salesforce features and to find the correct one to satisfy a business need. Ursa Major Solar, Inc., purveyor of high-quality solar energy equipment, is interested in encouraging volunteerism among its employees. Management cares about improving their community and understands the benefits of volunteerism to their employees’ and company’s health. Employees encouraged to volunteer feel more positively toward their employer, and they have reduced absenteeism thanks to improved health and happiness. While volunteering, employees learn more skills or gain experiences that let them take on new business responsibilities. By encouraging employees to volunteer on company time, the company invests in and gives back to the community that it’s a part of. Tracking employee volunteering provides additional benefits, including showing individual progress toward goals and providing the number of hours given overall and to specific community groups. At Ursa Major Solar, you’ve been working with another admin to build Volunteer Tracker, an app employees can use to sign up for and track volunteering hours. 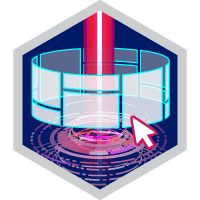 Previously, you worked at a nonprofit that used Salesforce’s Volunteers for Salesforce app to manage events and volunteers (to learn more, check out the Manage Volunteers for Nonprofits trail*) and will draw on this experience building a new app for Ursa Major Solar: Volunteer Tracker. Maria, the other admin working with you on the app, just left for a weeklong volunteering trip, and she asked you to finish the final pieces of the app on your own. You will wrap up the schema, connect some fields, create some clever logic, and build easy ways for users to sign up for and manage their volunteering. Wait, can you log these hours as volunteering? Account—a nonprofit organization where employees can volunteer their time. Ursa Major maintains a list of eligible nonprofits around the world. User—the employee record used for tracking event sign-ups and hours volunteered. This could be you. Volunteer Activity—a specific event for the volunteer organization, for example a Fall fundraising bake sale for a local animal rescue organization. Volunteer Jobs—the work, or tasks, to do related to the activity, for example a money handler for the bake sale. Volunteer Shifts—the day or time slots (or slot) for the volunteer job, for example the money handler needs morning and afternoon shifts covered over 2 days. Volunteer Shift Workers—the individual occupying one of the slots for the shift, for example Maria Jimenez signed up for the morning shift on both days. This custom object makes it possible to have multiple users as workers assigned to one volunteer shift, and multiple shifts assigned to each worker. The best Volunteer Tracker can’t help anyone without volunteer organizations, but Ursa Major Solar wants to ensure organizations meet certain criteria before activities can be created for them. The Volunteerism Board will research each organization and confirm it is a valid not-for-profit benefiting the community before the first volunteer activity can be created. To get started, install the unmanaged package. Then create the new Volunteer Organization Status field determining whether activity creation is allowed for the org, the unique page for volunteer organizations with the subset of account fields needed, the record type bringing it all together, and a compact layout. Use Pending Approval as the default. Also, provide edit access to this field on an individual-by-individual basis without modifying profiles. Call this solution "Volunteerism Board". 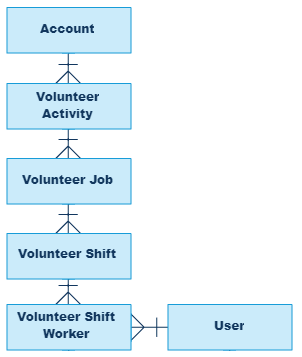 With volunteer organizations now available, it is time to build out the rest of the app schema. Maria helped you sketch out how the objects are related and the fields that will let them interact. All fields should be available to all profiles and added to respective page layouts unless indicated otherwise. Let’s get building! The correct relationships between objects ensure volunteer data can be used in reporting, records are deleted correctly, and field information can be in parent or child fields. Use the entity diagram and this chart to establish relationships between the Volunteer Tracker objects. Volunteer Shift Connects Volunteer Shift Workers to Volunteer Shifts with cascading delete and the option of roll-up summary fields. Volunteer Connects Volunteer Shift Workers to the user. Volunteer Job Connects Volunteer Shifts to Volunteer Jobs with cascading delete and the option of roll-up summary fields. Volunteer Activity Connects Volunteer Jobs to Volunteer Activity. A value should be required to save. Volunteer Organization Connects Volunteer Activity to Account with the option of roll-up summary fields. Only accounts with the record type we created of status Accepting Activities should be eligible to select. Organizing volunteering without the ability to sign up for, manage, and report on shifts is like maintaining a community garden without a good pair of gloves. These fields will help track shift status and volunteer counts. Desired # of Volunteers The Volunteer Shift object captures how many volunteers are required from the user. This required field allows whole numbers up to three digits. Shifts Taken Volunteer Shift displays the cumulative number of Confirmed or Completed Volunteer Shift Workers. # of Volunteers Still Needed Volunteer Shifts calculates and displays the difference between the number of required volunteers and the shifts taken, or zero, whichever is greater. Number of Shifts Volunteer Jobs displays the cumulative number of its shifts. Cumulative Volunteers Needed Volunteer Jobs displays the cumulative number of volunteers still needed for all its shifts. Wait, when was my shift again? Detailing the start and end times of shifts is key for volunteers to know when to show up for their shift. The Volunteer Tracker app will use this information to show volunteers their total hours and track top volunteers and organizations. Shift Start Time The Volunteer Shift record stores the date and time a shift should begin. This field is required. Shift End Time The Volunteer Shift record stores the date and time a shift should complete. This field is required. Build a rule called "Start before End" ensuring that Shift End Time comes after Shift Start Time with the error message, "No time travel allowed during volunteering! Shift Start Time must be before Shift End Time." Shift Hours Volunteer Shift calculates the number of hours a shift lasts from the start and end times. Total Vol Hours for Shift Volunteer Shift calculates the total number of all hours allocated to this shift from all the assigned volunteers. Calculate it using the Shift Hours and Shifts Taken fields. Shift Hours Volunteer Shift Workers displays this value from the associated Shift record. Shift Start Time Volunteer Shift Workers displays this value from the associated Shift record. Shift End Time Volunteer Shift Workers displays this value from the associated Shift record. Attributed Volunteer Hours Volunteer Jobs displays the cumulative number of volunteer hours for its shifts. With the relationships built, shifts tracked, and hours calculated, what else is there? These fields make using the Volunteer Tracker app more useful, provide better reporting, and more. Create a picklist on the User and Volunteer Jobs objects called Volunteer Skills using this value set. IsShiftVolunteer This checkbox, on the Volunteer Shift Worker record, is automatically checked if the user looking at a record is also the Volunteer, and is unchecked if it is not. This field will be vital to reporting on a volunteer’s specific information. Volunteer Organization Volunteer Job, Volunteer Shift, and Volunteer Shift Worker display the associated Organization name. Volunteer Activity Volunteer Shift and Volunteer Shift Worker display the associated Activity name. Volunteer Job Volunteer Shift Worker displays the associated Job name. Job Description Volunteer Job allows users to enter a summary of the job with the option for hyperlinked text for e-volunteering websites. The biggest worry for volunteer coordinators, other than running out of coffee, is that volunteers fail to show for their shift. Your nonprofit experience tells you that a major cause of volunteer absenteeism is a well-meaning friend or coworker signing someone up without their knowledge. Signing up a friend is also a big source of referrals, so allowing only self sign up won’t work. Instead you need to build in logic for a volunteer to confirm they’re going to show up if someone else signs them up. Name the process Confirm Volunteer Shift. While awaiting confirmation from the Volunteer, set the status to Pending Approval. Update the status to Confirmed if approved by the volunteer, otherwise change to Canceled. While the approval process will manage getting the confirmation, another automation tool will be needed to kick off the process. Call this tool Launch Shift Approver. Use this same tool to update the Volunteer Shift Worker record status to Confirmed if someone signed themselves up. Maria asked for a quick way for users to sign themselves up for a Shift directly from a Volunteer Shift record. Your solution was an action with the label Sign Me Up. To keep it simple there should be no fields on the pop-up. Instead the action automatically sets the Volunteer to the user clicking the button, changes the status to Confirmed, and assigns the currently viewed Shift as the new record's Volunteer Shift. Once the action is done show the friendly message "Congratulations, you are signed up!". Create the folders Volunteer Reports and Volunteer Dashboards and store reports and the dashboard in their correct respective folder. Continuous testing and reevaluation is key for a successful app builder to create a valuable product that matches project requirements. As such, you’ve likely created a number of different volunteer activities, volunteer jobs, and other records for testing along the way. If not, do so now—or these reports will be very sparse. This report type, Users with Volunteer Shift Worker Records, enables reports on Users if they have at least one associated Volunteer Shift Worker. For this report type, Accounts with Vol Activities with Vol Jobs, include Accounts with at least one Volunteer Activity that have at least one Volunteer Job associated. Climbing a mountain feels less like work and more like an accomplishment when you look back and see how far you’ve come. In the same way, the My Top Volunteer Organizations report shows each user which organizations they’ve volunteered with, the time volunteered, and the total volunteer hours. Using the custom report type with user data, create a Summary report grouped by Volunteer Organization showing each organization’s cumulative hours and no other columns. Sort high to low by hours. Details aren’t necessary. The report should include only shifts where the volunteer confirmed or showed up, and it should display only records where the user viewing it is the volunteer. Did your well-meaning teammate sign you up for a shift again without asking? The My Shifts Pending Approval report will show a user which of their shifts still need to be confirmed or canceled. Using the custom report type with user data, create a Tabular report showing the Volunteer Shift Worker ID, Shift Start Time, Volunteer Activity, Volunteer Job, and Volunteer Organization. Only pending shifts for this volunteer should be displayed. Even the best volunteers need a reminder now and then. The My Upcoming Shifts report shows a user which of their confirmed shifts are starting in the next 30 days. Using the custom report type with user data, create a Tabular report showing the Volunteer Shift Worker ID, Shift Start Time, Volunteer Activity, Volunteer Job, and Volunteer Organization. Only confirmed shifts for this volunteer should be displayed. A friendly competition has developed in the office to see which volunteer organizations can accrue the most hours. The Top Volunteer Organizations report and report chart fan the flames of this competition. Using the custom report type with account data, the summary report shows a list of Volunteer Organization Accounts with each org’s attributed volunteer hours, ranked from most to least hours. Details aren’t necessary. The report chart is a horizontal bar chart called Top Volunteer Organizations showing the attributed hours as the x-axis. Top volunteers are rewarded with praise, affection, recognition at major company events, and high-fives at Ursa Major. The Top Volunteers report and report chart help these volunteers prepare for fame. Using the custom report type with user data, the summary report groups by the volunteer’s name and summarizes each volunteer’s hours. Be sure the report includes only completed hours, hides details, and sorts volunteers from most hours to least. The report chart is a horizontal bar chart called Top Volunteers showing the shift hours as the x-axis. The My Volunteer Information dashboard brings reports together on one dashboard to provide each volunteer visibility into their commitments, progress, and pending shifts. Dan and the rest of the Volunteerism Board think the app functionality is awesome, and the reports beautiful, but that there would be more time for volunteering if the app was surfaced conveniently. Your task is to bring all the pieces together in one Lightning app with a Lightning app home page showing the volunteer data. Assign any image of your choosing that encourages volunteerism. Five recent items from Volunteer Activity and Volunteer Jobs with label "Recently Viewed Activities and Jobs"
If you are interested in a volunteer tracking app for your nonprofit or for-profit company, consider installing the open source Volunteers for Salesforce app from the app store. It allows additional reporting, sign ups for non-Salesforce users through a website, a job shift calendar, and more.